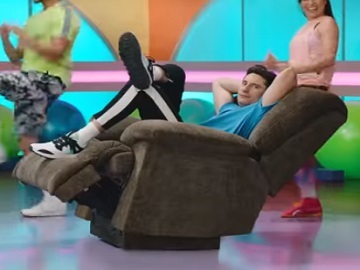 A guy shows people how easy it is to switch to GEICO, all while doing aerobics in a recliner, in one of the latest ads for the insurance company, promoting its mobile app. Titled “The World’s Easiest Workout,” the 30-second commercial features the protagonist, played by George Kareman, in a recliner saying to the camera that GEICO makes it easy to manage his policy and specifying that the app lets him pay his bill, add a vechile or even filing a claim, which makes it “not just easy,” but “aerobics in a recliner easy”. As the spot goes on it turns out he is actually doing aerobics in his recliner, in the middle of an aerobics class. “It’s not just easy. It’s GEICO easy,” the voiceover (Andrew Anthony) says at the end of the commercial. Kareman is an actor and director, known for Silicon Valley (2014), Broad City (2014) and Difficult People (2015). The commercial cast also includes Camille McLucus as the instructor and Michelle Janine, Mark Harari, Anais Fairweather, Najee De-Tieje as the four classmates. They are the latest names to join a growing roster of actors starring in ads for the insurance company. James Garrett portrays a grandfather whose nose performs Flight of the Bumblebee while he is napping, Bob Stephenson portrays a father who, while mowing his lawn, ends up with one last strip of grass that’s exactly the width of his mower and shares his success on social media, Mary Scheer as an “armsketball champion” that makes arm wrestling while shooting hoops look easy, Casey Campbell as a baseball fan who misses the opportunity to catch a foul ball, Jack Plotnick and Daniele O’Loughlin play a couple who turn their living room into a rain forest to reduce the stress of moving, David Anthony Hinton plays a nervous renter who covers his apartment in packing bubbles to keep everything protected, Daniel Roebuck plays Alexander Graham Bell as he rudely answers his phone in the middle of a show, Darren Richardson portrays the first heckler in recorded history, British actor Max Lloyd-Jones plays a knight teased by Richardson’s character. David Ebert made appearances in several ads, as well as Steve Talley, who played a space captain who lost the keys to his ship just when the galaxy needed him most.